On May 25th, 2018, the biggest overhaul of EU data protection law will come into force for all EU Member States with the introduction of the General Data Protection Regulation (GDPR). Under GDPR, banks and other organizations, blockchain or non-blockchain, which carry out identity checks and hold sensitive information about customers will have to be completely transparent about what happens to that data after it has been used. 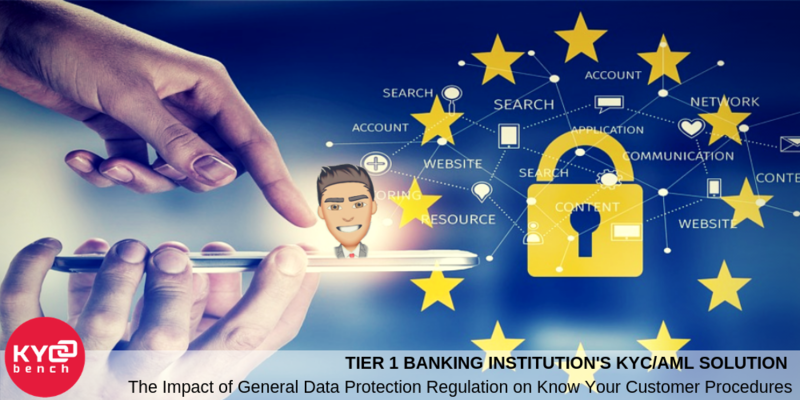 Adequate KYC procedures can be powerful Anti Money Laundering and risk management tools but the introduction of GDPR will have further consequences on the way businesses manage their customer data. Data protection has always been a high priority for the financial sector, but the impact of GDPR will be widely felt. Under GDPR financial institutions have to be stringent in their control in the storage of data. Many companies are still not careful enough; employees may be inadvertently storing data in the public cloud, inexperienced managers allowing unsecured BYOD’s (Bring Your Own Device) and staff taking work and sensitive data home. As KYCBench is constantly working on ISO/IEC 27001:2013 compliance, information security protocols are strictly defined in each area of the KYCBench operations, and upheld within third party organizations, to ensure that the requirements of GDPR are fully met. Data sensitivity has become so much more difficult in the digital age. Where a single photocopied passport might have been easy to keep track of, the amount of digital data and the simplicity with which it can be shared creates a heavy burden on those who hold it. Automated onboarding, monitoring and data enrichment processes applied in KYCBench to manage the requirements of GDPR.